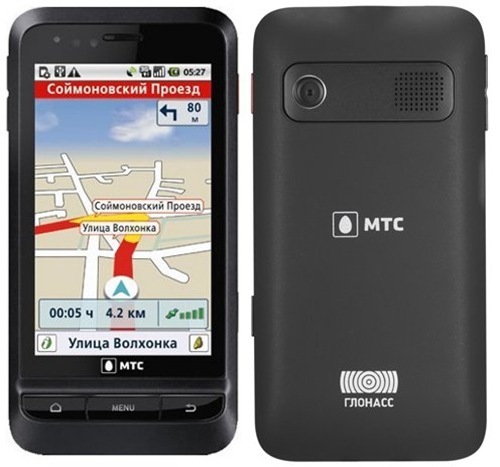 MTS launches GLONASS phone, a GPS rival Technology! GPS means global positioning system and is the Xerox of navigation system. I haven’t heard of any alternatives to this system. Until now. Apparently GPS is the American way of doing things. And there is a Russian way, Chinese way and an Indian way. While all these alternative ways are existing for quite a while and are being used in national projects, none of them were available for mass consumption like GPS. We have to make room for one more line item in the satellite navigation system. Global Navigation Satellite System (GLONASS) the Russian way of finding the location is out for commercial use and MTS has released MTS GLONASS 945 in Russia equipped with GLONASS. MTS GLONASS 945 is the new smartphone launched with GLONASS capabilities. The phone is manufactured by ZTE and runs Android OS Froyo (2.2). It has a 3.2 inch TFT Capacitive touch screen, 2 megapixel camera, 130 MB internal memory, Bluetooth, accelerometer and 1500mAh battery which provides 5 hours of talk time. GLONASS satellites cover the whole of Russia and the MTS phone can be used with comfort across Russia. If you are wondering where else will the GLONASS powered phones be used other than Russia, then the answer is India. Russia and India have shared a cozy relationship for many years now. India imports a whole of weapons and shares technology across many other functions. GLONASS is one similar technology which Russia has shared with India. India is the first country to be given access to GLONASS satellites and is successfully used in BrahMos missiles. Of the 24 Russian satellites which are operational, India has access to 18. Whether the satellites cover the whole of India is something we don’t readily know but my guess is they would be. Given India’s tight relation with Russia and give the Russian telecom operator MTS’s presence in India, GLONASS equipped phones will make its way to India before they go anywhere else. Is it necessarily a better technology than GPS? Would it be costly to get a GLONASS phone? These questions pop up when we hear of a new technology, the answers to which can only be found on waiting. Russia itself is making a big push by imposing duties on GPS enabled phones. It cannot get the same support from India but it can persuade few manufacturers to sell these phones or pop both GLONASS and GPS in the phones. Mi Bluetooth Speaker Basic 2 Launched: Powerful Performance, Compact Size! Is it necessarily a better technology than GPS? Its necessary to buy Nike while you can buy Adidas. ?? Why eat in Burger King while there is Macdonals?? Why LCD when there is PLASMA? competition makes possible to get smarter technology, its rather a conclusion that Russia as the only leader in space technology should develop a second better coordinating system . Its only good for us that this technology is shared with us. When all this outdated sattelites that coordinate the GPS system start fallin down to earth, its the best for us to have a system that cover it up or its even better.